I bear within the essence of my will. To hold me in myself. Its been another busy week at school, as we come to the close of Term 1 already! It was great to see the CSSK community at the Irmhild Kleinhenz talks this week and we look forward to more of these events in 2018. I look forward to seeing you all at the Easter Festivities next week and wish you all a pleasant break over the holidays. 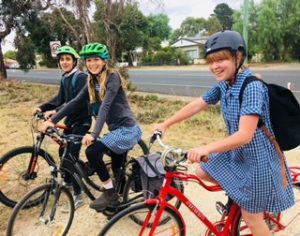 These three Castlemaine Secondary College students have started their year with a new school and a new way to get to school – by bike. 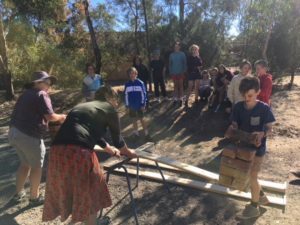 Previously bus travellers out to Castlemaine Steiner School & Kindergarten, when they graduated to year nine at CSC, the chance for a new mode of transport was possible. In co-hoots with each other or not, each set of parents refused to drive these 14 year olds to their new school. Instead the parent group encouraged and enabled using ‘pushies’ as an independent mode of transport. 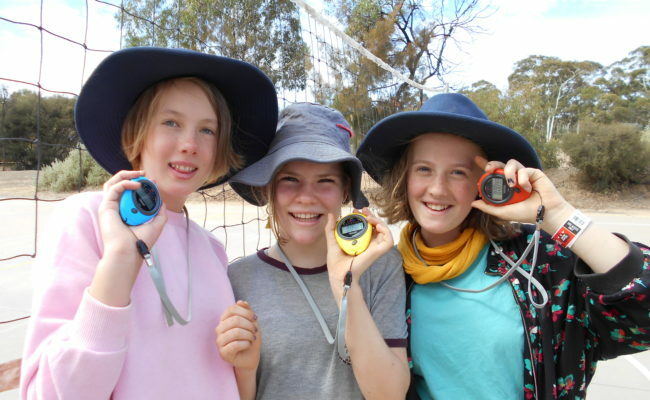 Last year these three participated in Walktober, which is a VicHealth initiative taken up by the Mount Alexander Shire and many local schools, to encourage active transport to and from school. The Steiner School students completed up to eight rides to and from the Muckleford campus over rough, rocky and quite hilly terrain. These three students say that those rides gave them the confidence and enthusiasm to ride to CSC this year. When asked what they liked about the riding, the students gave bright eyed, excited responses. It seems that the independence of such transport has opened a whole new world of opportunities. Casual visits to friends houses after school, trips to the library and, importantly drop in’s to the local ice-cream shop on the way home. They also enjoyed the exercise benefits of riding up to 14km per day, as well as the simple joyful feeling of riding a bike. Mostly travelling together, the group uses the Campbell’s Creek bike trail for much of the ride. This trail was chosen initially for its safety but they soon found it more social to ride together along the trail. All in all this is a great outcome for VicHealth, Mount Alexander Shire Council and our town in general. Give them a wave and a cheer (the author does whenever she sees them) if you come across these teenagers or any other kid making the effort to ride to school. We had a lovely Saturday doll making recently with Mary Hirsch-Jones. Mary told us she thinks she has made over 3,000 dolls in her lifetime so there was a wealth of experience to draw on. We are hoping to offer opportunities later in the year for more doll making now that we have so many experts in our community. Yesterday we had the privilege of meeting Irmhild Kleinhenz, an Anthroposophical Health Consultant who works out of the Melbourne Therapy Centre at Warrenwood. Irmhild spoke with such gentle wisdom and experience about ways to support children as they develop physically and emotionally. Many parents have said they would like to have more seminars and workshops on aspects of parenting and child development. If you have any specific ideas, please feel free to get in touch. All Parents and Friends are welcome to join us for our Easter Festival on the last day of term. We’ll gather in the Heartlands from 8.30 for hot cross buns followed by an Easter Assembly. Click here for more your invitation. The Fee Retrieval Policy has recently changed and all families can familiarise themselves with the new policy here. Fees are due at the end of Week 3 of each Term, and a late payment fee will now be applied at the end of Week 4 and Week 8 for overdue accounts. If you would like to discuss your payment options further please make a time to see Neil. There are payment plans available and Direct Debit options. All children entering our Early Childhood programs must be signed in an out each day by an adult. Older siblings, i.e. Minors are NOT permitted to drop off or collect younger siblings. This is a legislative requirement for all early childhood services. Another busy week in Kinder! We look forward to seeing you all at our small Easter gathering next Thursday. Well here we are nearly at the end of our first term in Prep. It has been a wonderful term. 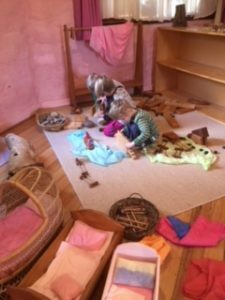 How busy we have been and how much the children have developed and learnt already. We are looking forward to sharing our Autumn Festival with families on the last day of term, Thursday 29th March at 8.45am. Best wishes for a relaxing Autumn holiday. Hello Class One families! I am having a delightful time with the Class and wish to share some pictures of our recent work. Here are the beginnings of our Easter Tree and thank-you everyone for sending in your blown eggs. 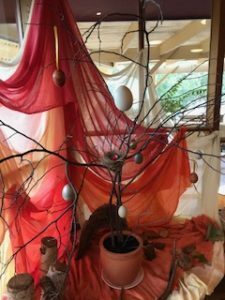 The children are loving this activity and wanted to also put a tiny little baby in the nest. Look closely! I hope to see you all at our Hot Cross Bun morning next week! We have been working on our numbers during Main Lesson, and here are some of the fabulous artwork they have been incorporating this into. We are learning so much everyday that I would like to ask that all families do their best to come for Main Lesson everyday. I understand sometimes there are family things on or tiredness to contend with, but even if they just come for Main Lesson it would be great. What a busy and fruitful term Class 2 has had! We have just finished our Times Tables and Number Pattern Main Lesson and the little group of travellers have decided to stay in this land for a bit longer to show the people there, many other patterns they find in nature. Our Chinese fans that we begun for the Chinese New Year are completed and hanging in the class room. We have put the finishing touches to our Corn Dollies, and they went home yesterday as new companions for each of the children. Enjoy the holidays and have a wonderful Easter! We have been looking at plant time and animal time leading into our Main Lesson which follows the measurement of time. Many interesting questions are being asked! We also are continuing to celebrate Harmony Day with some of our Parents from diverse cultural backgrounds telling a small story or cooking with us. It is always a challenging first term for children stepping into Class 3 but the children in our class community are coming each day with enthusiasm and support for each other. We are looking forward to the Autumn break. Do enjoy many special moments with your children during this time as I will with mine. It has been a wonderful term introducing the children to the Norse mythology. The stories have provided rich inspiration for their creative work. Their magnificent representation of The World Tree- Yggdrasil bears proof. Wishing everyone a restful Easter / Autumn holiday. 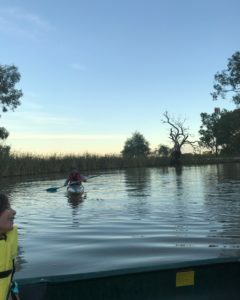 Class Six are back from a wonderful canoeing camp where we paddled up the Serpentine Creek lined with reeds, hawks, water hens, ducks and amazing ancient red gum trees. 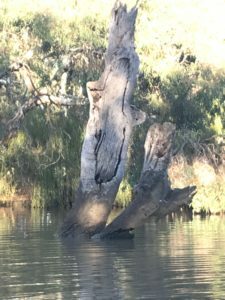 We learnt that it takes 200 years for a hollow to form in a trunk. We had a visit from and visited some farmers who’s families have been in the area since the 1870’s. 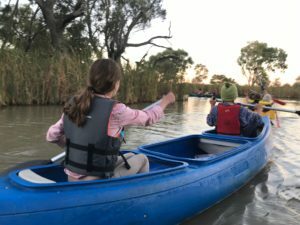 They impressed on us how important it was for them, the up-coming generation, to be aware of how to look after the land as the Aboriginal people had done for thousands of years before white settlement. We also had a wonderful introduction to our new Main Lesson on Astronomy with beautifully clear views of the Milky Way as we drifted off to sleep under the stars. We have had a very dynamic fortnight in Class 7 exploring effort and force in our Mechanics Main Lesson. We have assembled and used a number of simple machines to gauge their effectiveness, and the Class 7s have been working hard on constructing their marble runs. A huge thank you to Evan for spending a very exciting and interesting morning with us settling up systems to use pulleys! Also a huge thank you to Rakaia, Tyber’s mum, who joined us on Harmony Day, sharing with us her connection with the Native American culture, and giving us an opportunity to connect with our own sense of identity and belonging. Looking forward to seeing you for our Easter Festival this coming Thursday from 8:30am. 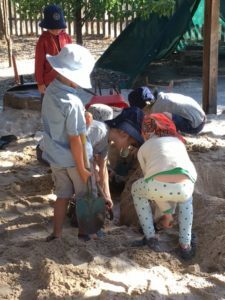 As we approach the end of Term One, Class Eight students have participated in a variety of activities relating to their Main Lesson themes for the term. We have really enjoyed our investigation of Food Chemistry with a particular emphasis on chemical changes in cooking … which has led us to some class cooking sessions making Anzac biscuits, banana fruit muffins (and a delicious gluten free chocolate cake courtesy of Harriet!) We have also discovered that food evaporates very quickly when hungry students (and parents) are around! Last week we commenced a Main Lesson looking at Physics of Air and Water. 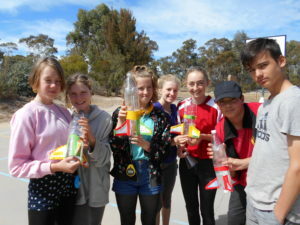 The highlight of the week was our Friday Rocketry Day with Ken Chapman, who introduced students to the physics concepts around distance, time and speed measurements through the construction and launch of some incredibly impressive student-built rockets – the highest of which travelled further than one hundred metres above the Senior Oval. It was very inspiring to see students follow through on this task from theory to design, launch, and collection of data. As it happened, the week also marked the passing of notable physicist Stephen Hawking, so it might be timely to finish with his words: Look up at the stars and not down at your feet. Be curious! The Movement Program has continued this year for all the children in Classes 1 and 2. 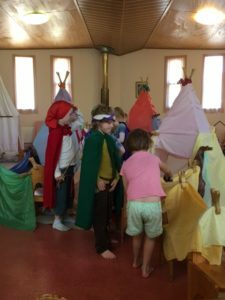 They come along to the Eurythmy room each week for a 45 minute lesson. There are lots of opportunities for “getting into their bodies” including the developmental exercises on the mats and the eight special bean-bag exercises, which are taught with verses and very particular movements to develop spatial and co-ordination skills. The Class 1’s are all pleased with their new skipping skills (with the big rope), which we have been learning and practicing over the last few weeks. It’s wonderful to see the joy in the children when they eventually get the “jump-bounce” rhythm going! The Class 2 children are developing “clever toes” as they enjoy the fishing game. It’s quite tricky to wriggle those jewels out from between little toes and onto the lily pads. They enjoy pencil rolls and barrel rolls on the mats every week and also doing the wheelbarrow exercise with a partner. It’s nice to see them becoming stronger. I look forward to continuing our work together this year. For homework it’s…. swing, bounce, skip, roll, balance and catch! I wanted to wish you a lovely Easter and let you know that I won’t be at school next week since I will be going to Mexico! I will be back next term for the second half of the second week to keep enjoying my work! Take care and see you next term. We have moved from various practice games, which promote participation, various body movements and enjoyment, to more technical aspects associated with ball skills, such as throwing and catching, and ball striking using cricket bats. These activities help the children to improve their ball tracking skills, spatial awareness and control of gross motor skills. It is very pleasing to see increasing focus and concentration from the children, attributes required when first being introduced to new technical skills or when looking to improve upon existing ones. Well done to Ken Chapman who made an A Grade 50 recently in his cricket semi final! It was a terrific effort and I was glad to be there on the day to see a great game unfold. Unfortunately Ken’s team lost to my club, Barkers Creek (haven’t played this year), who went on to win the A Grade final over the weekend. Young Edward from Class 8 also made a valiant effort in the A Reserve semi final finishing with about 17 runs in a 70 odd run partnership for the last wicket, facing bowlers twice his age and who are rather quick! His performance almost gave his team enough runs to secure victory, but unfortunately it wasn’t enough. Edward however, like Ken, can hold his head very high for his wonderful effort. Well done lads. Bring on the AFL season now. Go Bombers! Have a wonderful Easter holiday. Let’s stay active throughout this wonderful time of year, before the cold winter months start to effect our exercise enthusiasm. Hello again to all of you! I would like to thank all of my fabulous students for their commitment this term. I would also like to thank the parents for their support. I am enjoying working here immensely and look forward to another fun and productive term. Happy Easter to you all and have a safe and relaxing holiday. These ‘funny faces’ are part of our warm up exercises for clay work. They will be fired in the kiln and appear sticking out of plant pots at home. The children really enjoy this activity. All of the projects are progressing well, with completion early next term. Thank you for another creative term. Enjoy your Easter break and the cooler weather. We harvested some funny shaped carrots for our Tuesday cooking! ‘The Great London Bake Off’ has come around again! Lauren’s dear sweet Granny is heading off to Europe to compete with her world-famous Lemonade scones. The Scones Are to Die For!! An action-packed show for the whole family. Created by Castlemaine Youth Theatre. www.trybooking.com or at the door. We are seeking a nanny to provide a continuation of care within the home for our children in as natural and loving a manner as possible, where it feels like an extension of the family. You would attend to all duties associated with the children during a day while in your care (ie. food prep, clean up of activities and toys), together with light house duties (ie. if we hang washing and your day allows, bring it in or vice versa; put contents into slow cooker for tea); and we would seek that you enrich the children’s lives through sensory experience; through movement and through imitating the routine they see modelled throughout the day (involve the children in cooking, tidying, folding). 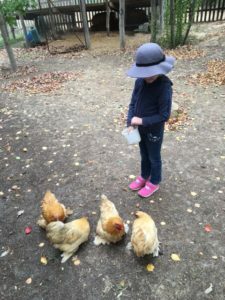 We have two children – Winifred 4 (Kinder at CSSK) and Henrietta 2 (Playgroup CSSK). We are seeking care for Tuesday, Wednesday, Thursday, 8:30am-4:30pm. During this time Winifred is at kinder 8:45-3pm. We offer $20 per hour, with public holidays paid, plus any expenses for craft materials, cooking etc. If you feel that you are the right person for this role, we look forward to hearing from you! If you feel you are the right person, however have questions regarding how this might fit with your own family, please still contact us, we are happy to talk things through. For the right fit, days and hours can have some degree of flexibility. 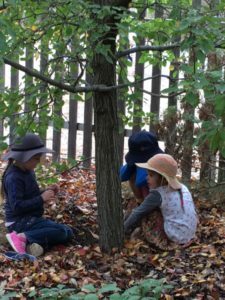 Have fun camping at, learning about and caring for Mount Alexander. 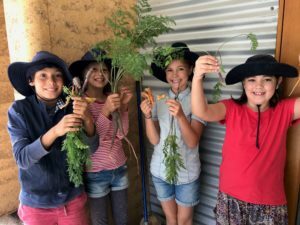 This is a free event hosted by the Victorian Landcare Program and includes a working bee caring for native plants, nature activities for all ages, learn about local history and Aboriginal culture and a night walk with a park ranger! Please contact Marg Stevens on 0412 807 971 for any further information. Hi there! My name is Teeka, I’ve recently moved to Campbell’s Creek and am looking for a family to care for. I’m halfway through my studies of Steiner Education and am currently studying holistic counselling and permaculture design. I have 5 years of babysitting and nannying experience and have volunteered in schools across Asia teaching young children. For more information please get in contact on 0455 956 340. I look forward to hearing from you. Workshop 1: 9:30am to 12 noon for 7+ year olds (Newbies/beginners). Workshop 2: 12:30pm to 4:00pm for 10+ year olds. Learn to solder and make a crazy cricket or frog to take home. from The New Settlers and special guests. Bring your own knitting, hand sewing, drawing etc. or just come for a cuppa and listen to the music. Young Makers Market 21st of April 2018. 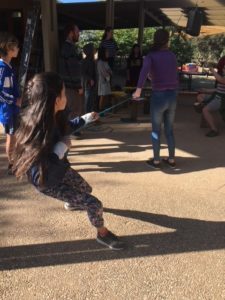 The Young Maker’s Market will be open from 12pm to 5pm on 21st of April at the Western Reserve, Forest Street, Castlemaine. There will be an inside area and tables for anyone who doesn’t have their own equipment. All young people between the ages of 12 and 25 are encouraged to demonstrate they creativity in whatever area that so choose at this amazing event. Everything from art, to embroidery, clothes, woodwork and horticulture is encouraged! Our only rule is that you must have made it yourself. 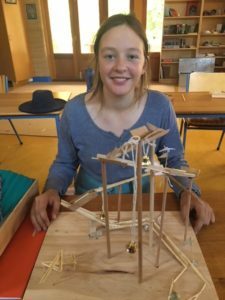 Anyone interested in having a stall at the Young Maker’s Market or have any enquiries, please contact the Mount Alexander Shire Youth Advisory Group at youth@mountalexander.vic.gov.au or call Shannon Lacy 0429 369 894 or complete the attached registration form. 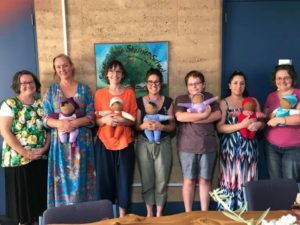 The Orality Centre’s new Mnemonic Arts classes are the result of the work developed by Castlemaine’s own Dr Lynne Kelly. 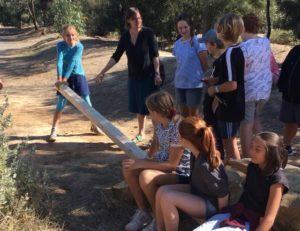 Her research into the ancient memory systems of indigenous cultures from around the world have been organised into a 10 week course that can help students of all ages with all areas of their schooling. Utilising a variety of Arts based practices students will learn how to construct their own Memory Palaces; improve their literacy skills with music and storytelling; develop their numeracy learning with drawing and sculpture; and develop individual techniques to help them memorise information related to their own areas of personal interest.